We take great pride in the fact that Wild Apricot can do a lot of terrific things "out of the box." With our easy website builder, you can customize the look and feel of your membership site with about the same amount of effort that it takes to create a decent looking document in Microsoft Word. Sometimes this kind of ease-of-use comes at the sacrifice of power, but not necessarily so with Wild Apricot. Because so many of our design elements can be changed using common cascading style sheets or CSS (the standard design scripting using for nearly all web pages,) with a little know-how you can create custom designs that go beyond our regular templates. One of the best places to get inspired to tailor your site is on the Wild Apricot Customization Forum. Here, customers and Apricots share tips and ideas, including code that you can copy and paste right into your site. 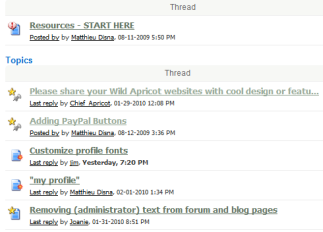 A great place to start with this forum is a recent thread that asks participants to share Wild Apricot websites with cool design or features. Be sure to check out this discussion, and if you have a great site to contribute, by all means jump into the conversation!